The group overseeing the development of USB standards released the technical specifications for the USB 3.1 Type-C connector, which will eventually replace the various types of USB connectors on the market. 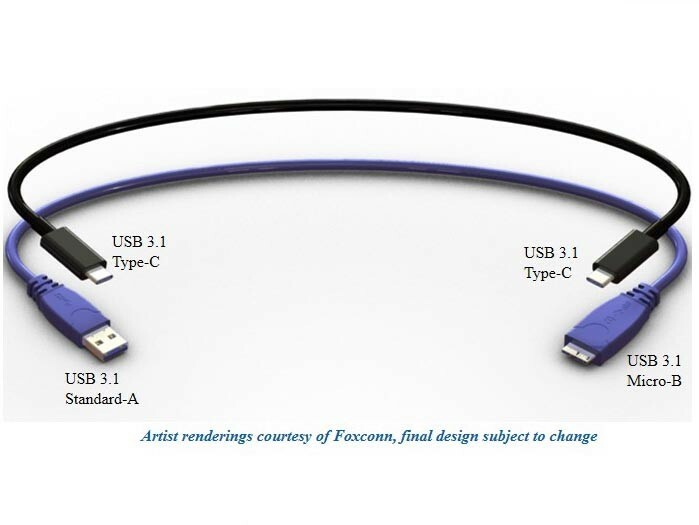 The first details about USB Type-C were released in December 2013, while in April, we saw the first render of the new connector. Back then, the USB Implementers Forum (USB-IF) promised that the standard would be finalized by the middle of the year. Now the documentation seems to be finalized (or very close to finalization) and is available for download here. As soon as the standard is complete, manufacturers throughout the electronics industry will be able to use the new connector for their designs, and eventually abandon the many variations of Type-A and Type-B connectors currently available. The move to USB 3.1 Type-C will bring multiple benefits to users – first off, Type-C connectors are universal, meaning that they will replace the larger Type-A USB plugs we all know from our computers, but also the microUSB and miniUSB Type-B variations at the other end of the cable. USB 3.1 Type-C cables will feature the same type of plug at both ends and they will be reversible, so they will fit in regardless of the way you plug them. Once the standard becomes widely used, one cable will work with countless devices, from laptops, to smartphones, to cameras, to hard-disks, to printers. Type-C connectors are the same size as the standard Type-B microUSB connector used on most Android smartphones. The small size will allow for slimmer designs on devices like laptops. And because Type-C cables can deliver up to 100W, they could even be used for powering laptops and other devices. The big caveat with Type-C is that it’s not backwards-compatible, meaning that you will need adapters to use Type-C connectors with current devices. Now that the standard is finalized, the ball is in the manufacturers’ court. Surely, it will be years until the current Type-A and Type-B variants are phased out. But the good news is we’ll finally get the universal, powerful connectors we’ve been waiting for.